Remember our recent post on the uncommissioned sculpture of NSA whistleblower Edward Snowden that was erected in a Brooklyn, NY park one night at the beginning of April, and taken down the very next day? (In case you didn't here's a link to the original post discussing the sculpture itself). 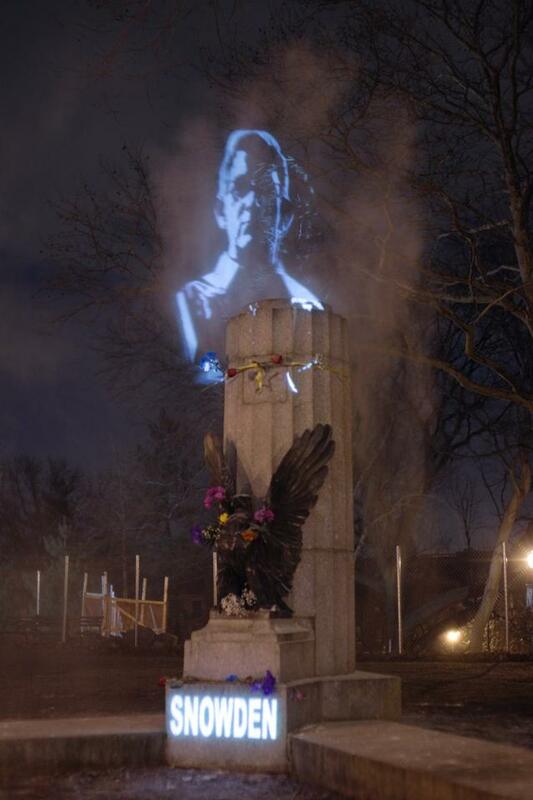 Well, not to be outdone by perceived censorship, a completely different group of artists banded together to create a hologram of the original Snowden bust in the very same park. "Inspired by the actions of these anonymous artists, The Illuminator Art Collective recreated the intervention ephemerally by projecting an image of the sculpture into a cloud of smoke. Our feeling is that while the State may remove any material artifacts that speak in defiance against incumbent authoritarianism, the acts of resistance remain in the public consciousness. And it is in sharing that act of defiance that hope resides." "We were surprised to see the way the statue was covered up before its removal, as though it were a profane statement. We were equally heartened to see the outpouring of support New York, and people online, have shared. Seeing flowers on the now empty monument was incredibly inspiring, but when another group of artists "reinstalled" the bust and nameplate in light, we were truly touched. It proves the meaning of the piece, and the tough questions it forces us to answer, will endure even though it's no longer physically present. We're thrilled this has inspired others to take creative action towards raising awareness about what it means to be an American, and a hero." Apparently, the Illuminator Art Collective regularly works with activist groups in the attempt to bring public awareness to their particular campaigns, although it must be said that this writer has never run across their work before. There is a certain beauty to the idea of replacing supposedly censored artworks with holographic memories of the originals, but the inherently fragile nature of a hologram almost seems more of a funereal dirge than a celebration.